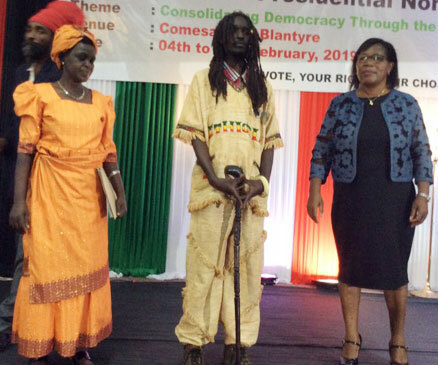 It started like drama or some social media prank when Ras Chikomeni David Chirwa revealed intentions to run for the presidency in the May 21 2019 Tripartite Elections. Chirwa, who became popular because of his ‘one tree to prosperity’ message gained instant acclaim from voters: casual or not. ‘One tree to prosperity’ was a subtle, no, overt, call for the legalisation of Indian Hemp which, he argued, is untapped gold that would make Malawi prosperous. Chirwa had his day Wednesday when he had to present nomination papers to Malawi Electoral Commission (Mec). Dressed in a checkered red and white shirt under a gold linen caftan African suit ironically embroidered with the word ‘Ethiopia’, and carrying the staff of David, Chirwa, who came in a modest saloon, was welcomed to Comesa Hall with pomp and funfair by supporters who danced their way into the hall. He posed with the Rasta-hand through out. Chirwa introduced Catherine Lyness Kayange as his running mate to the applause of the jam-packed hall. He was given ovation every time he made Rastafarian salutation. After presenting his nomination papers, it was time for the Police Brass Band to entertain the crowd while Mec commissioners scrutinised Chirwa’s nomination papers. At 14:41 hours, Mec Chief Elections Officer, Sam Alfandika, rose to make an announcement that chairperson of the electoral body, Jane Ansah, had a word to give. The hall went silent. “We thank you, our distinguished candidate, for coming forward to submit your papers. You have been observing from Monday that after the papers have been received, the brass band plays music because, at that time, we are scrutinising the papers to see if all the requirements have been fulfilled. “Having scrutinised your [Chirwa’s] papers, we found that there are two conditions that have not been fulfilled; that is, you have not made the payment, as provided for in Section 45(1), which reads: “At the same time as the nomination paper is lodged, there shall be deposited with the returning officer by or on behalf of the person nominated, such sum as may be determined by the commission which shall not be refundable”. So, the first thing that our distinguished candidate has not complied with is that, at the time you are submitting your paper, you have not paid your nomination fee,” said Ansah to chants of “tisonkha, tisonkha” (we will contribute) from the crowd. Ansah further said Chirwa failed to meet the required number of signatories, hence his nomination papers could not be accepted. Chirwa said it is sad that he had to pay to enjoy his own constitutional rights in the country. “It is very sad. I just came to exercise my constitutional right to contest in the elections but they say there are rules. This is my right and why should I pay to enjoy my right? They are talking about the Parliamentary and Presidential Elections Act while I am talking about the Constitution of the land which is superior,” he said. On the issue of nominations, Chirwa said it was difficult for an independent Presidential candidate like him to meet the requirement of getting at least 10 nominations in every district within such a short time. “I do not have structures like a political party. I am an independent candidate and I have asked for an extension. I also think we need to have an independent [candidates] Act. Independent candidates cannot be governed by a Political Parties Act,” he said. Chirwa then said he had asked for extension of the two days he has been given to fulfill requirements. And so it ended just like it started; drama.